Read the 2017 State of Transit in New Orleans report here. Despite continued progress, we’re still falling short in a key area – helping people get to where they need to go. 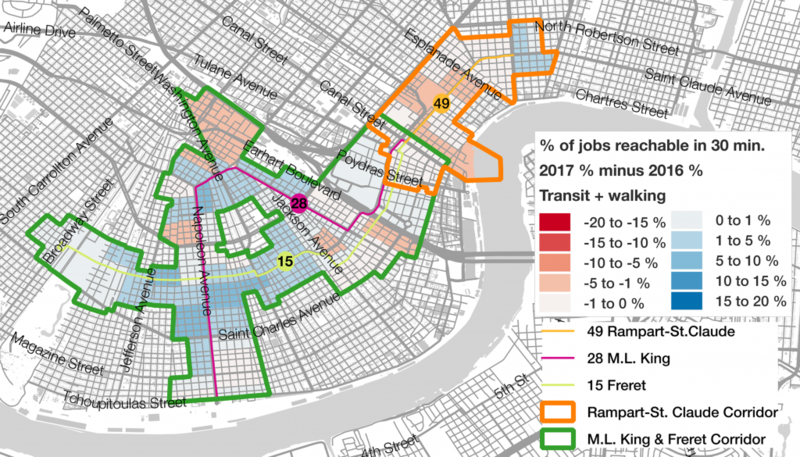 The average New Orleanian with a car can reach 86 percent of the region’s jobs in 30 minutes or less, but residents who take the bus, streetcar, or ferry can, on average, only reach 11 percent of the region’s jobs in the same time period. Unfortunately, our biggest recent capital investment – the Rampart/St. Claude and Loyola streetcar extensions – did nothing to help with access to jobs. We dedicated $75 million in public money to the project, but residents along the Rampart/St. Claude corridor saw a slight reduction in total jobs accessible in 30 minutes or less via transit. Regional transit connections continue to be poor. Only 13.9 percent of the regional workforce can reach the CBD – the most accessible major jobs center in the region – in 30 minutes or less via transit. Trips that would take under 30 minutes in a car take significantly longer via transit. For instance, a one-way transit trip from the West Bank to Ochsner Medical Center on Jefferson Highway – where the number of jobs are expected to double in the next few years – takes an hour and 45 minutes via transit. But we also saw positive momentum. At the same point that the Rampart/St. Claude streetcar extension opened, the RTA also reconnected the #15 Freret and #28 Martin Luther King bus lines to Canal Street. This very low-cost move, made a big difference. Collectively, riders along those corridors were able to reach 5,000 more jobs in 30 minutes or less via transit. We applaud the RTA Board’s hiring of a new Executive Director to oversee the management of the system and the relationship with Transdev, the private company that operated, manages, and plans the RTA’s transit system. That move will bring more transit expertise to the publicly appointed guardians of the system and help the RTA to earn increased public trust. The RTA’s strategic mobility plan – the long-range plan expected to be completed by the end of the year – has a lot of potential to create a clearly defined path toward improvement. But that will require the right kind of details and specifics be filled in over the remaining months of the planning process. We have made undeniable progress : The 2015 and 2016 service enhancements were a needed step in the right direction. 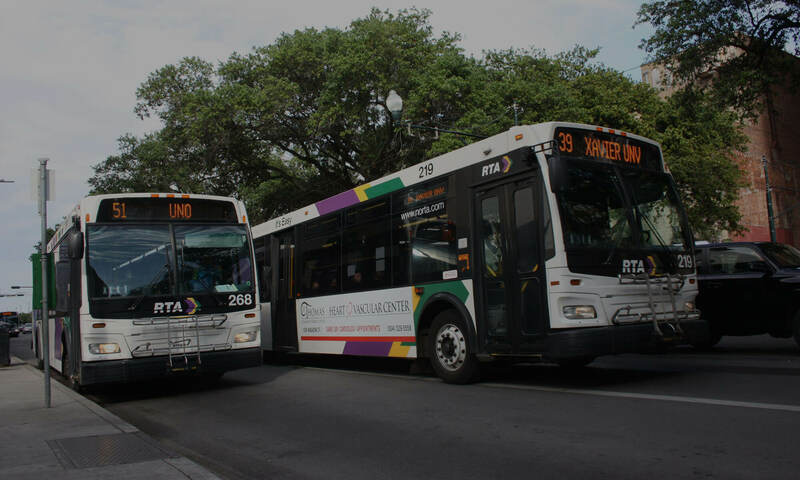 In April 2016, the New Orleans Regional Transit Authority (RTA) added about 11% additional vehicle revenue hours (VRH – the time that a transit vehicle is actively serving paying customers) with a focus on expanding later evening and early morning trips. Overnight transit service was added on eight lines, raising the total of lines providing 24-hour service to nine. Early morning service was added to 15 lines. Additional weekend service was added, increasing the total amount of weekend service by 28 percent.